Bonus points for KU with a bench unit in. Charlie Moore to KJ Lawson for 3. Terrific time to give up a 4 point play. Quentin Grimes drive = good things happen. Vick followed that up with one of his vintage foot-on-the-line 2-pointers. Ochai wanted that pass to be an oop - it wasn't and he was not exactly prepared for it not to be. Only 39 teams in college basketball have a higher 2-foul participation rate than Texas Tech. So not that surprising to see Culver in the game with 2 fouls, as TTU trails by double digits. Wow what a defensive play!!!! Wow vic playing well...thank GOD!!! Charlie Moore to Ochai Agbaji for the slam. #kubball with 7 assists already. Jayhawks are just draining 3's, which is obviously out of character for them this season. Dotson with a dime to Grimes, who swishes it. #KUbball leads 39-24. Timeout Texas Tech. Impressive offensive display from a team that has really been struggling on that end. KU shooting 56 percent overall and 59 percent from 3-point range. 2:33 to play 1st half. 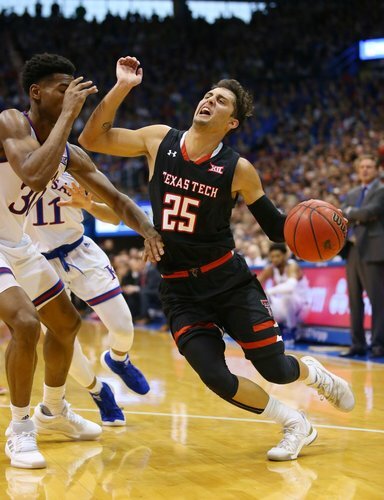 Texas Tech hasn't beaten this bad since the great dust storm of 2018. One of the best halves this season where everyone was on the same page. Hope we can keep it going. ROCK CHALK!!! KU up 46-26 at halftime. Both Vick and Dedric have made 3 3-pointers. KU is 9 of 15 from deep. Tech is 3 of 14 on 3's. Dedric went from no post in the first half to post to start the second half. 2nd half is under way. Grimes misses a 3 to open and Tech is headed to the FT line. #KUbball won't need much on offense, but they'll have to keep it up on the defensive end to salt this one away. You know what these teams need? A super long time out less than a minute into the 2nd half. Wow ...can we rebound the ball. Really enjoy watching Dotson play!! !